Many earthquake prone countries have significant amount of existing deficient buildings to be evaluated for seismic actions. Although nonlinear methods are more preferable for assessment of existing buildings, most of the practicing engineers are unfamiliar to these methods. Therefore, linear methods seem to be in use in the near future for assessment of great number of deficient existing buildings in a reasonable time. In linear methods, nonlinear behaviour is taken into account by a single parameter: strength reduction factor (R) which is used to greatly reduce the elastic force demand accounting for the nonlinear behaviour. 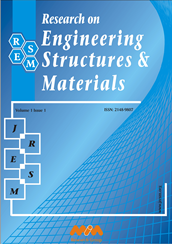 This study evaluates the use of R factors for different ductility and performance levels of buildings with respect to different soil site class. It is observed that the R factors: decrease with increasing periods, are more sensitive for higher performance levels, may change more than 30% with respect to number of story or transverse reinforcement amount, and may change 20% depending on the site class. However, effect of site class is generally smaller and a clear trend is not observed. Exemplary R values for different ductility, performance levels and number of stories are provided in the study. © 2018 MIM Research Group. All rights reserved.